Being located in the sub-tropics, Brisbane is a warm, sunny city with many indoor and outdoor attractions to keep locals and tourists busy. There are a host of zoos and wildlife sanctuaries nearby which offer some amazing animal encounters. There is also the Cultural Precinct at Southbank, which includes The Queensland Museum, The Sciencentre (pictured above), The Gallery of Modern Art and The Queensland Art Gallery. he Brisbane River itself is the best tourist attraction. You can either enjoy it for free at any of the parks (New Farm Park is my pick), walk across the Story Bridge, excercise along the river bank at the Kangaroo Point Cliffs or take a cruise on a City Cat. I agree - the Brisbane River is a big highlight of any visit to Brisbane. Southbank Parklands is pretty hard to beat. An inner city beach, a fantastic splash park and a great choice of cafes nearby. Plus, it's totally free. Brisbane lacks any major tourist draw card, rather it is a variety of little activities that make the Brisbane experience. 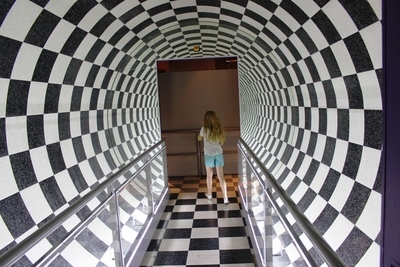 For kids it is hanging out in kid friendly spaces like GoMA and the Queensland Museum or just swimming on the "Beach" in South Bank. For those people who are hip and happening, then it is walking through Paddington or West End. For the Adventure conscious you can paddle the Brisbane river, climb the story bridge or abseil down it (or do the same at Kangaroo point cliffs). 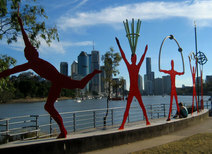 For me the great appeal of Brisbane is its lovely spaces, historic buildings, art and greenery that lines the rivers. You can walk along the river front seeing historic buildings such as Customs House, pass through the botanic gardens, cross the river and do the art trail along Kangaroo point, wander through markets in South Bank, the "Beach" and a rain forest to a Nepalese Pagoda. Since the 1980s the river front has been continually transformed and while Brisbane is not spectacular it manages to provide many very beautiful humans spaces to pass through. The Brisbane Greeters are Brisbane's best tourist attraction because they are enthusiastic and knowledgeable volunteers who will take you to the types of tourism spots which most appeal to you. If you don't know what you want to see, you opt for "Greeter's Choice". If you have something special in mind, it's "Your Choice". These greets are free and can be booked at www.brisbanegreeters.com.au. Spending the day at Southbank is the best for locals or tourists - you can swim, visit the galleries, eat at the cafes, catch the Citycat ferry, or just stroll along the river promenade.